Representing everything in life that tempts us, harms us, or may even kill us. 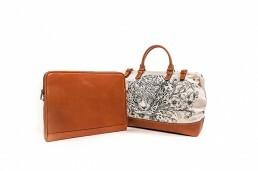 This bag pairs two of the world’s deadliest creatures— the snow leopard and the Autumn Crocus. Each of these beauties can kill a human being within a matter of seconds, but we can’t help but be attracted to their beauty. Snow leopards are extremely deadly and usually attack from above killing their prey with an immediate bite to the throat. The Autumn Crocus is filled with Colchicine, a drug so powerful that it can cause an immediate cardiac arrest. These creations are as rare as they are deadly, as they are both on the World’s endangered species list. 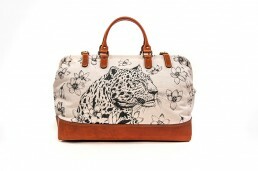 On the front of the bag, the snow leopard is in prowl mode, surrounded by Autumn Crocus tendrils. 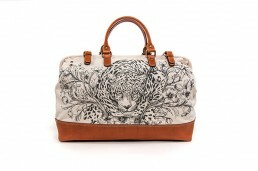 On the back of the bag, the snow leopard exhibits peaceful serenity with the Autumn Crocus floating around her. This bag holds the yin and the yang, the dark and the light, the essence of reality.